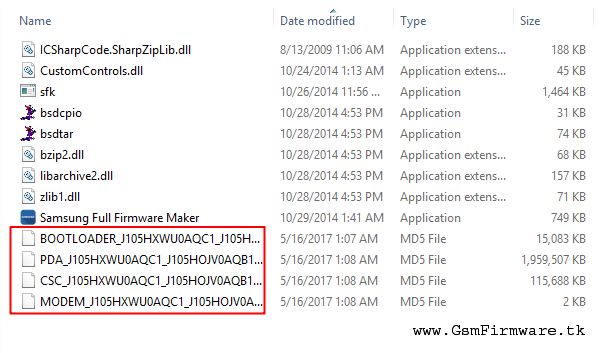 Samsung Full Firmware Maker Tool help you to make one PDA file to Bootloader, Microsoft.PDA, world !CSC and Modem 4 Samsung firmware files.It's very easy and powerful tool.This tool work on Windows Operating System anMicrosoft.NET Framework v4.0, Dependencies: libarchive2, bzip, IC Sharp Code’s Share Zip Lib, Custom Controls, sfk. How to Make 4 Firmware Files (Samsung)? 1. Click on Open to choose Samsung .tar.md5 Firmware file. 2. Click Unpack Button to Unpack Rom First otherwise you face error " Sorry.We don't support this type of firmware yet.Please wait for the update.Thanks". 3. After Complete Unpack ROM Click on Make Button and wait for finished. 4. 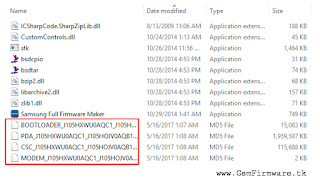 Samsung 4 Firmware files will out in "Samsung Full Firmware Maker v1.0" Directory. 5. Bootloader, PDA, CSC and Modem 4 files maker process complete.